Figure A57. Mariana anomaly, interpreted as the Mariana slab, with (horizontal) [vertical] cross sections through (A)[D] the UUP07 p-wave) and (B)[D] the combined SL2013 and S40RTS s-wave models at 810 km; C) the location of the modern geological record that we interpret to have formed during the subduction of the slab. The Mariana anomaly (Figure A57) was first shown in seismic tomography by Spakman et al. (1989) and Van der Hilst et al. (1991). 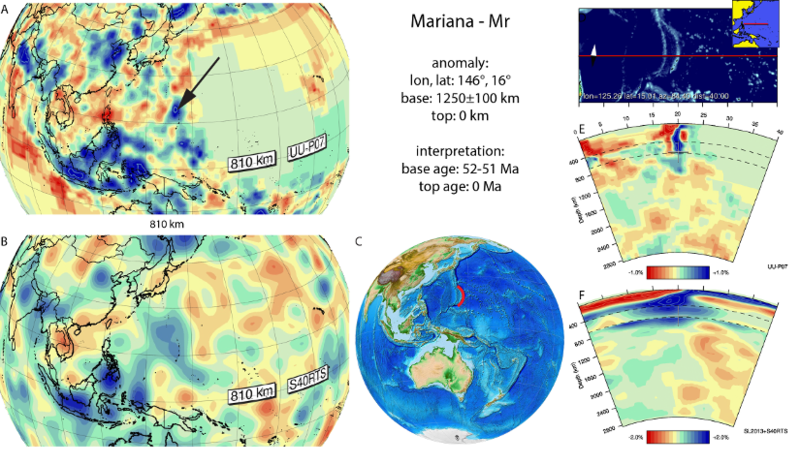 In subsequent tomographic models, the Mariana anomaly, which is an steeply westward dipping, N-S trending anomaly that connects to the Mariana trench and the slab is thus interpreted to represent still-subducting Pacific lithosphere. It was imaged to penetrate the lower mantle down to 1000-1200 km depth (Bijwaard et al., 1998; Widiyantoro et al., 1999; Gorbatov and Kennett, 2003; Huang and Zhao, 2006; Rost et al., 2008; Fukao and Obayashi, 2013; Jaxybulatov et al., 2013; Obayashi et al., 2013; Zahirovic et al., 2014; Wu et al., 2016). To the north along the same subduction zone, it is connected in the upper 300-400 km to the Izu-Bonin slab. Below that depth, however, the Mariana and Izu-Bonin slabs are disconnected through a tear fault that may have formed at the subducted Marcus–Necker Ridge and the Ogasawara Plateau, with the Izu-Bonin slab lying horizontally on the 660 km discontinuity and the Mariana slab penetrating through (Miller et al., 2004; 2005). To the south, the Mariana slab is also bounded by a tear (Miller et al., 2006). Previous reconstructions estimated subduction of the Mariana-Izu Bonin subduction zone to have started at 48 Ma (Seno and Maruyama, 1984) to 50 Ma (Wu et al. 2016). Prior to 50 Ma, Wu et al. postulate that a western Pacific plate boundary already existed but was this may have been characterised by highly oblique subduction or transforms. After 50 Ma, Pacific plate motions changed and fast subduction began (Wu et al., 2016). The Mariana-Izu Bonin forearc has been instrumental in the development of models linking geochemical evolution of subduction-related magmas in a forearc position to subduction initiation (Stern and Bloomer, 1992; Dewey and Casey, 2011; Stern et al., 2012). U/Pb and 40Ar/39Ar ages of the oldest forearc lavas that are believed to have formed during subduction initiation are consistently 51-52 Ma (Ishizuka et al., 2011; Reagan et al., 2013), which we adopt as age for the onset of subduction of the Mariana slab.